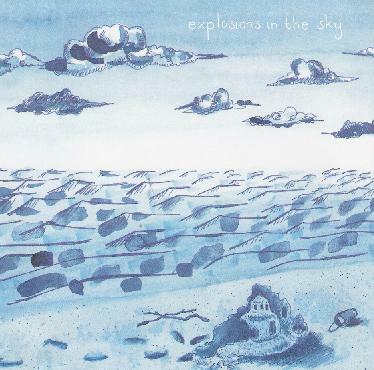 Explosions in the Sky - "How Strange Innocence"
Austin's Chris Hrasky, Michael James, Munaf Rayani and Mark T. Smith are the two guitars, bass and drum of EitS and this is the reissue of their 2000 debut as a young (possibly teenage) rocking combo. The promo material expounds much on their subsequent growth and achievements, but this album was originally pressed barely enough to supply extended family and a few friends, so this was a much needed release. There's already been much reference to a "warmer" Godspeed You Black Emperor! or Mogwai, and this sounds accurate. I've had mixed reactions to all three groups. For one, I would guess that, like Mogwai, Explosions are a far more powerful live act. But depending on my mood (and many of the individual tracks), I tend to find their sound grand, inspiring and highly-charged, or languishing in lazy, maudlin, unengaging post-rock limbo and balladry. "Snow and Lights" definitely grabbed me from the start with its slow sad intro riff and the later loftier licks (ouch). Typically, bass-guitar plays a key role and contributes muchly to the incessantly somber tone. The drums are tight and stand out as the most technically dynamic of the lot. Guitars alternate between clean picking and heavier distortion during the rhythm crescendoes (though with minimal fx, only occasionally venturing into shoe-style noise). The epic "Time Stops" gets into some intense riffing and rolling where they sound the most like Godspeed!, and this climax and fade-out is one of the most moving moments of the disc. "Remember Me as a Time of Day" closes on strong notes as a slow soothing tone of sadness and reverie, though just when I got ready to settle into a nice groove I was thrown with some off (minor?) notes. Well, if that sounds indefinite and a little confused it adequately reflects my feelings about the album. Let the track-titles help you invoke - that's why they're there. And picture a quartet of young men bypassing their mouths and "playing from the heart"... (and recording and releasing their first disc of 300 copies! )...a nd it's a little more... heartwarming. For more information you can visit the Explosions in the Sky web site at: http://www.explosionsinthesky.com.